Situation: In an NCAA game, the offensive team punts on fourth and 10 at its own 30. 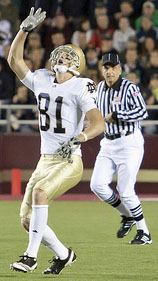 While the kick is in the air, a player from the receiving team blocks below the waist at his 42, and an official throws his flag. The deep receiver catches the kick at his 35 and is tackled at the 45. What happens with regard to the penalty? Situation: In an NFL game, the offensive team faces 4th-and-10 on its 25. The punt is partially blocked, hits on the 28 and then bounces back to the 22, untouched by anyone beyond the line. 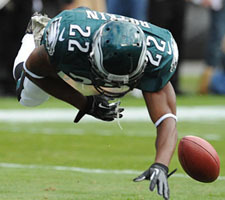 A member of the punting team recovers the ball at the 22. What happens in each of these cases? He runs with the ball to the 33. He runs with the ball to the 36. He throws a pass from the 22 which is complete at the 50. Situation: An NCAA team has 2nd-and-5 at their own 40. The offensive team trails with less than a minute remaining in the game. The QB drops back to pass and, unable to find an open receiver and under a heavy rush, throws the ball forward into the ground behind the line of scrimmage. The referee throws a flag for intentional grounding. What happens now? Situation: In an NCAA game, Team A punts from its 45 to Team B. During the punt, a player on Team B is flagged for holding at his 48. The receiver catches the kick at the 26 and returns it all the way to Team A's 3 where he fumbles. The ball strikes the goal-line pylon. Situation: In an NCAA game, team A faces 4th-and-12 at its 40. 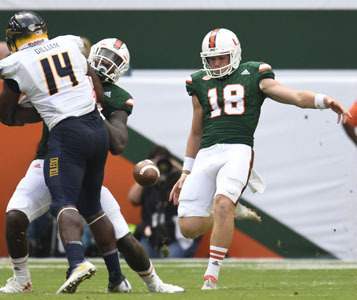 The punter shanks the ball to his right, and a teammate catches the ball behind the neutral zone and carries the ball to Team B's 45 where he is tackled. Situation: In an NCAA game, the offensive team trails 20-18 late in Q4 and has no timeouts left. On 3rd-and-7 at the opponent's 40, the QB drops back to pass, cannot find an open receiver, and scrambles to the 25. 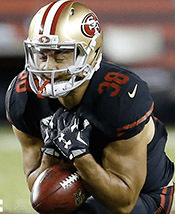 Unable to get out of bounds, he throws the ball forward to the ground to stop the clock, which reads 0:38 when the play ends. 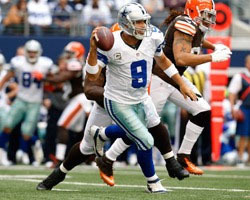 Dallas QB Tony Romo goes back to pass. Under a heavy rush, he throws the ball at the feet of two offensive linemen 5y in front of him while being hit. 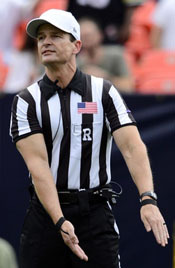 The referee throws a flag for intentional grounding. 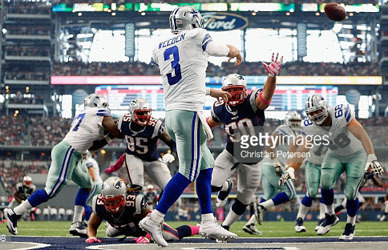 However, defensive holding is also called on TE Jason Whitten, Romo's intended receiver. An NFL game goes into OT. Team A receives the kickoff and moves downfield far enough to kick a FG. Team A's kickoff is muffed by a player on the receiving team, and a player from Team A recovers it. In an NCAA game, the offense, Team A, faces 4th-and-10 at its 40 late in Q2. Team A has five players in the backfield at the snap as it punts. 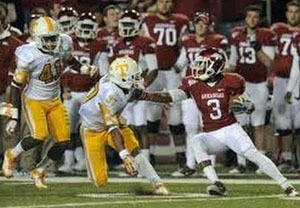 A member of Team B catches the kick at his 30 and is tackled at his 45. During the return, a member of Team B clips at his 40. Time in the first half expires during the down. 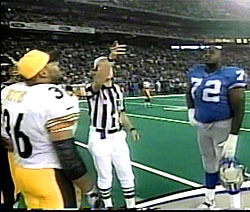 Which of these statements are true about the opening coin toss in the National Football League? Only the referee need be present for the toss. The referee must confirm the choice of the visiting captain (heads or tails) before flipping the coin. If the coin lands on its edge (as on a muddy or snow-covered field), the referee must reflip it. If the coin lands on a player's school, the flip counts. In an NFL game, the offensive team faces 3rd-and-5 at its 7. The QB attempts a backward pass to a HB. A defender bats the pass in flight over the end line. In an NCAA game, the offensive team faces 4th and 10 at their own 10. The punter lines up deep and takes the snap. He carries the ball outside the tackle box and kicks it, rugby-style on the run. 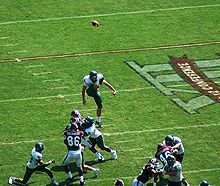 After the ball is away and as the punter is regaining his balance, a defensive player launches and drives the crown of his helmet up under the punter's facemask. Which is true about the kicker in NFL football? Every player in the field of play, including the kicker, must wear shoes on both feet every play. A kicker may have no shoe on his kicking foot but must wear a shoe on the other foot. A kicker may have no shoe on either foot. In the NFL, which of the following situations with the clock running under one minute in the half would result in a 10-second runoff? In an NFL game, a team faces 4th-and-10 on the 50. The punt is bounc­ing toward the pylon. 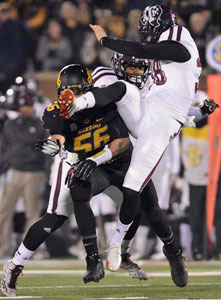 A member of the kicking team steps on the side­lines at the 1 and then dives for the ball, which is still airborne 1y in the EZ and bats the ball back to the 2. Another member of the kicking team recovers and falls to the ground in 3. Team A punts, and a member of Team B signals for a fair catch. He muffs the kick at Team B's 25 and completes the catch at the 30. During the kicking, a Team B player blocks in the back against an opponent at Team B's 45. Where will the ball be placed for the start of Team B's possession?